We love Jaipur. It’s whip-smart and as sleek as a sail-boat. It is superbly gripping, which is quite a feat for something that has no rough edges. As we discussed in our enthusiastically positive review it had to overcome a fair degree of indifference when we sat down to play. No other game in my experience has so confidently climbed such a steep gradient of expectation to end up on top. So – you definitely should play it. However, the question of whether you can play it remains to be addressed. Let’s find out with another patented Meeple Like Us accessibility teardown! Jaipur gets an unambiguously clean bill of health here. While colour is used to convey information regarding goods it is not the only channel through which that information is presented. 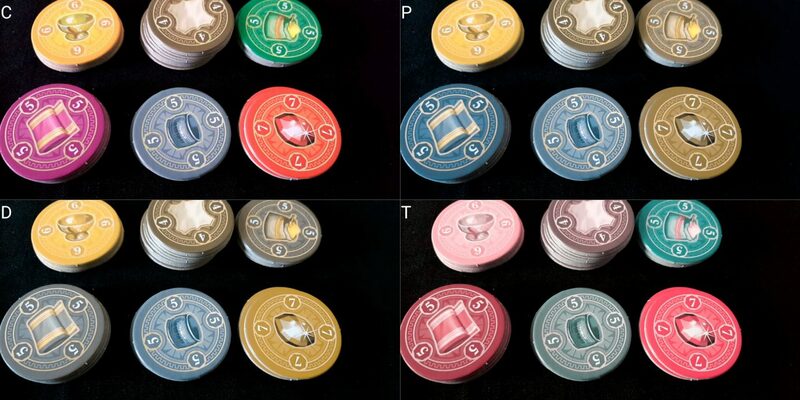 Goods tokens too have the correct kind of good displayed in the centre. This isn’t quite as visually distinct because the symbols are somewhat smaller, but it’s clear enough in most situations where there is no compounding issue of visual impairment. 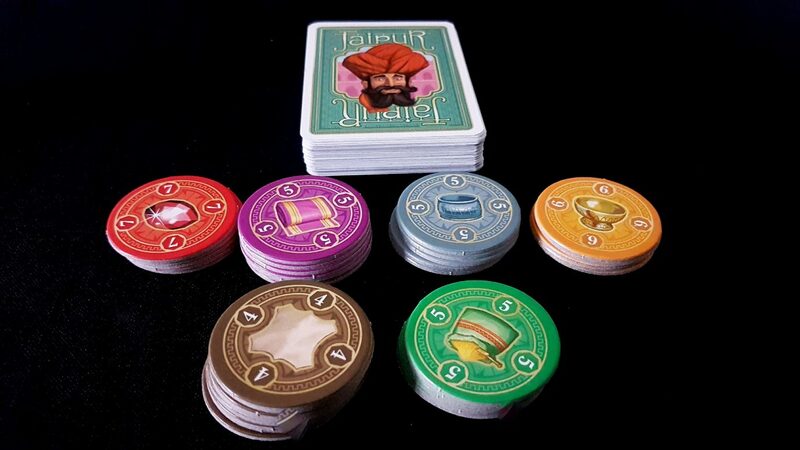 Since the only components in the game are the cards and tokens, we strongly recommend Jaipur in this category. Vibrant colours and large images are used to differentiate the various goods. While this won’t assist in situations of total blindness, it should permit the game to be broadly playable when dealing with cases of minor to moderate visual impairment. Each of the card types is considerably different from the others, and only five cards at a time in the marketplace must be assessed. This has to be done in relation to your own hand of cards, but this tops out at seven and as such the task of working out the best action doesn’t require a huge amount of visual processing. Since there are relatively few goods too it’s feasible to simply ask what’s in the market and make the assessment against a close inspection of your own hand. As to the tokens, there’s more of a visual problem. While they adopt the same bright vibrant colours of the cards themselves, each token also holds key information regarding the value of each sale. That in turn changes the impact of decision making when it comes to selling off your inventory. The first sales are always going to be the most lucrative, and whether goods are best used for sales or trade for other goods from the market is going to depend on how many you can put together in a deal and the value of each individual element. The first three leather are worth nine points. The last three leather are worth three. However, it might still be worth making the sale if you can put together a set of four or five. This shifting context of value is what gives Jaipur its frantic energy but it does mean you need to be constantly aware of how many tokens are still in play and the value displayed on each. You can potentially leak game information too by inquiring about it – ‘how many gold tokens are left’ can also be phrased as ‘I’m looking to sell gold soon, so you’d best dump yours now if you want to make a profit’. The numerical values are well contrasted, for the most part, but small and convey a lot of important information. It’s not a game-breaker, but it is impactful on gameplay. The good news here though is that the value of goods follows a fixed decay – the tokens aren’t randomised, they’re sorted in decreasing order. You can get by with a looser appreciation of the exact values by focusing on which goods have been sold and in what quantities. If someone sells four leathers, they only have real value from that point on for their set values. Gold, silver and diamonds on the other hand retain value through to the last token. Familiarity will ease the problem of identifying these small-font values. 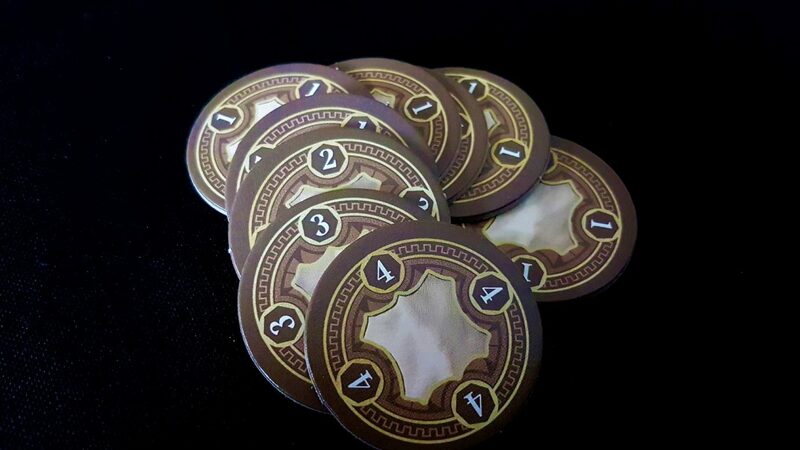 When the round is over, all tokens are flipped over to reveal their point value. This is going to require players to do a fair degree of sorting tokens into arithmetically convenient piles. The obverse is well contrasted with large numbers that make it relatively easy to parse the visual information although this is overlaid onto a busy background. Sorting into piles of ten will alleviate most of the rest of difficulties of this visual parsing exercise. This is what you’ll be using to buy love in Jaipur. 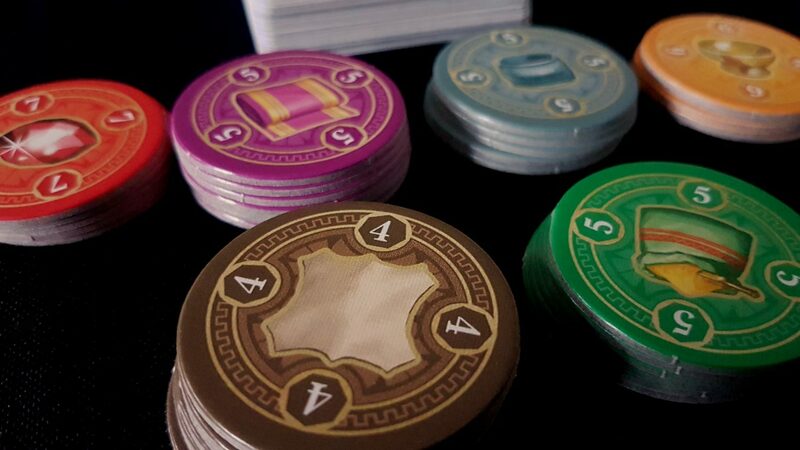 We’re prepared to recommend Jaipur in this category – while the value of tokens isn’t a minor problem, it’s one that will become increasingly easy to deal with as familiarity builds. In the meantime, you can obfuscate signalling by examining all piles at the same time instead of focusing assistive aid attention on the ones that are most relevant to you. You can treat it something like a feint, or a bluff. Jaipur is mechanically light but tactically deep. The rules are not difficult to explain, and they don’t have any of the usual trigger points that signal areas of concern. There is no conditionality, no synergy of play, and no alteration in game-flow. You take a turn, and then someone else takes a turn. True, what you do on that turn can vary each time but it still falls into a set of very restricted options. The game is likely to be too complex to play if dealing with very severe categories of cognitive impairment, but otherwise the mechanisms themselves will likely not be a barrier to enjoyment. That’s only as far as the rules themselves go – the game also requires a degree of implicit and explicit numeracy. There is an obvious requirement for being able to count when it comes to making sets and assessing remaining tokens. There’s an obvious need for the ability to do relatively simple arithmetic at game end and the point of making a deal. However, the value judgement of when to make a deal is more complex, requiring skills more akin to an informal and uncertain algebra due to the way three, four and five set deals work. A deal is worth the face value of the tokens, plus an uncertain amount based on the bonus token obtained. This might be a one, two or a three for a three good deal. It might be four, five or six for a four good deal. It might be eight, nine or ten for a five good deal. If you have five leather that you sell at one coin each, that’s five points plus between eight and ten. It’s a thirteen to fifteen deal. Is that better than selling three gold at seventeen points with a bonus of between one and three? Obviously no it isn’t in this case but the deals become subtler as the game goes on. What about selling three cloth for 3, 2, and 1 versus two diamonds at 5 each? It’s not hard to work out the best deal to make, but the game requires you to do this arithmetic quickly each turn if you are to find the maximum point of value for your sales. This is complicated by the fact that this deals with only a fraction of the story – the rest of the numeracy here comes in in terms of the push your luck element at the heart of the market. If I have four leathers I can sell them off for a certain amount, but what are the chances I can turn that into five leathers? That depends on how many leathers we’ve already seen, how many are still likely to be in the deck, and how many leathers my opponent has been hoarding. The contents of my hand, and that of my opponent, can shift rapidly as they are swapped in and out of the market. The assessment of probability can be difficult at the best of times, and while it is a numerate decision it is on a deeper level one of an intuitive understanding of risk and timing. Sometimes the right time to do a deal is not when it seems mathematically optimal but when you think your opponent is going to undercut you. And then coupled to this is the gradient of risk represented by camels in the marketplace. 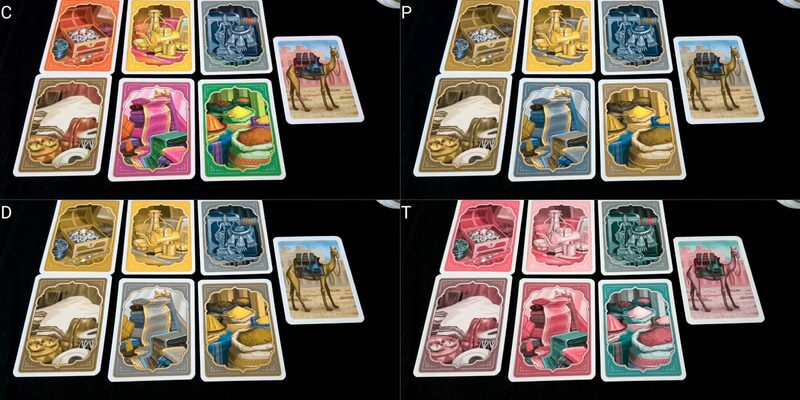 It’s tempting to grab four or five camels in a single turn but that’s going to result in a near or total refresh of the marketplace. Your opponent will get the first choice of what’s revealed. Is that safe to do? It depends on what’s happened up to this point and how lucky you feel. This all exacts a significant cost in terms of fluid intelligence but Jaipur also puts considerable pressure on memory. Good play is dependent on having an idea regarding what deals can be made in the future. That in turn is a function of what’s come out of the deck, what your opponent has collected and sold, what you have in your hand, and the distribution of cards that remain in play. There’s no point holding out for that fifth lucrative gold card if two of them have already been sold. The game offers a visual reminder in terms of the discard pile, but it otherwise requires you to remember how many cards of each type are in play. There is always one more card for a good than there are tokens, but even that memory aid requires you to know where the tokens have been going. As usual here we need to consider whether the game is still fun without everyone playing like Machiavellian chess computers. 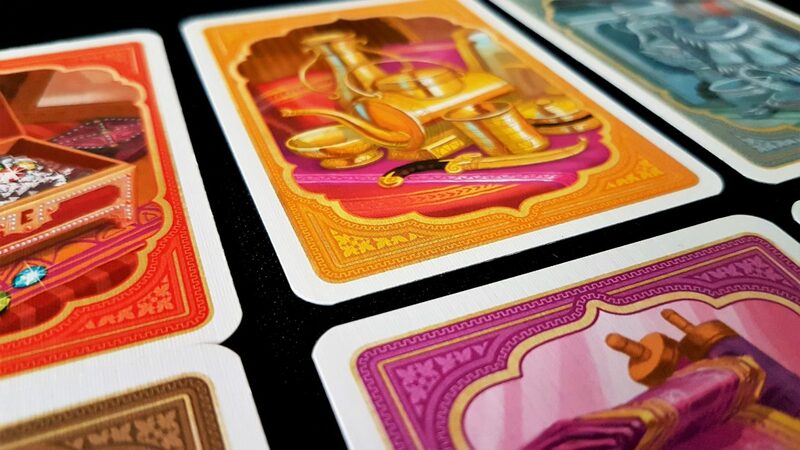 Here, we have some good news – Jaipur is at its heart a set collection game and it’s always going to be satisfying to make a set, pick up some nice tokens, and then count them up at the end. Someone assessing the deck and carefully balancing the risk is almost always going to completely destroy an opponent that but you don’t need to do that in order to have fun. If you’re willing to play it with your killer instinct dialed down, it’s likely to be playable with care by those with fluid intelligence impairments. Someone may have to handle the explicit arithmetic but that too can be downplayed as an element of scoring. 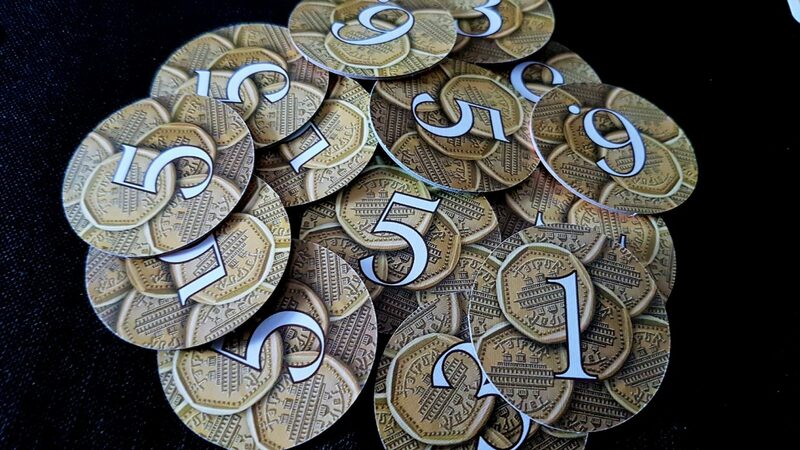 A cognitively accessible variant for the game would be to count the number of tokens obtained rather than the individual value of these. Memory impairments can be compensated with more open play – making sure everyone can see how many tokens of each type have been claimed. The rules state you put them in a stack in front of you, but a more cognitively forgiving method would be to put them in separate stacks. With these modifications, we’d be prepared to recommend Jaipur in both categories of cognitive impairment. Without them, we’d recommend you avoid Jaipur. There isn’t a lot of direct competition in Jaipur, but there is an awful lot of undercutting and trying to keep the goods another person wants out of their grubby hands. So much of the core of Jaipur is about finding the right moment to dump your inventory, and that’s going to depend in large part on the person across from you at the table. It can be frustrating too to see you lay responsibility for your own destruction at your own door. Picking camels out of the market is sometimes the only move you can make to advance your agenda. In the process you might find yourself revealing a good that your opponent wants, or that they know you want. That by itself can be the thing that loses you the game – a round of Jaipur can genuinely be that tight. If you have two gold, and your opponent has two gold, then the one that gets a three or four set first is going to profit from the deal although you can dump the two you have to shave some of the value off of their eventual triumph. Some goods though hold value quite well and in the end all you do is remove yourself from the running of a more lucrative deal. It can be disheartening to pick up four camels to see two of the gold you were desperately hoping to get entering the marketplace only for your opponent to snap them up. Jaipur is a game of timing and of controlling the momentum of revelation. If you stumble there you can end up on the back-foot for the rest of the round with no easy way to undo the damage you’ve caused yourself. Don’t let that unduly worry you – Jaipur is played best of three (or five, or seven, or whatever you feel is needed) and as such it lends itself well to correction on the fly by extending the playoff as is necessary. However, the counterpoint of that is that it lends itself well to extending the playoff. if you’ve ever been in a situation where someone is unable to lose gracefully and ends up yelling ‘Okay, best of seventeen then!’ Jaipur might need you to take an unusually firm hand with your opponent in setting the context of play. Losses can exhibit considerable score disparities. While one point squeakers are relatively common it’s just as common for one player to have fifty points while an opponent has ninety. Luck plays a significant role in Jaipur, although I’d dispute it’s as serious a role as many of its critics claim. Nonetheless, sometimes you’ll find yourself on the receiving end of a shellacking with few obvious ways that you could have done better. When someone lays down four gold in the first turn they’re starting with such an early lead that your role in the rest of the game is largely a formality. These are relatively minor worries though because Jaipur is an intensely quick game and it’s possible to knock out round after round in a short period of time. As such, it’s not like you’ve played three hours of an epic session only to find yourself absolutely destroyed at the end. Jaipur is a series of relatively painless losses. It hurts in the gradual accretion of loss rather than in any individual case. Trust me, I should know – I would estimate I’ve lost around 90% of the games I’ve played with Mrs Meeple, and we’ve played this a lot. We recommend Jaipur in this category. 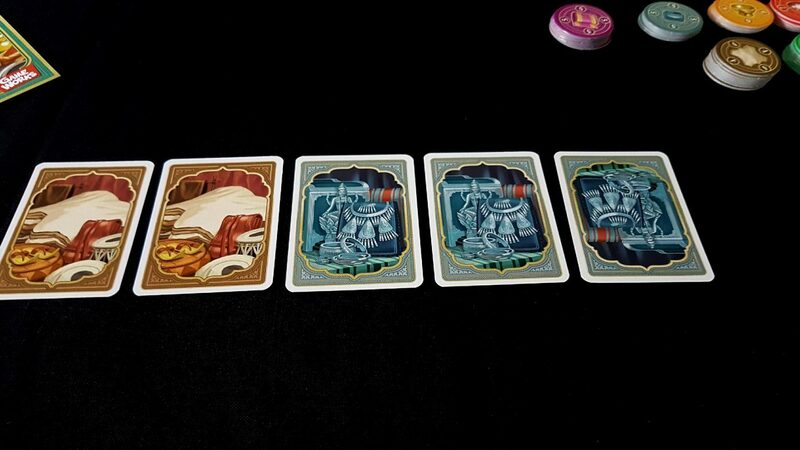 Jaipur requires players to manipulate two separate decks of cards. One is their hand itself, containing their trade goods ready for the market. The other is their ‘herd’, which contains their camels. The hand is secret, the herd is face up in front of them but necessarily completely transparent as to the quantity. The hand has a limit of seven, the herd size is limited only by the number of camels in the deck itself. 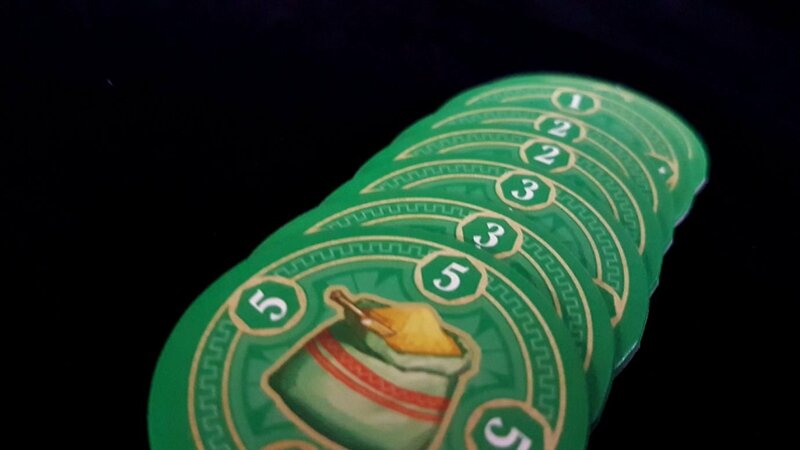 When cards are selected from the marketplace, they’re exchanged either for camels or from goods in a player’s hand. That is unless only a single trade good is being collected, in which case it’s just added directly to the hand without a swap being made. When goods are sold they’re put in a discard pile, and the correct number of tokens is picked up from the token piles. Since these are all separate elements they can be distributed around the playing area in whatever way is comfortable for all players. The only problem here is that the goods tokens must be sorted in ascending order at the start of the game, which can be awkward. The bonus tokens must be shuffled, which is not necessarily the easiest thing to do with a set of five, six or seven circular discs. The game too requires a lot of shuffling at the beginning of play – as with Lords of Vegas the nature of the game means that sets will clump together when they are discarded and insufficient shuffling will have a major impact on the rhythm of revelation to follow. You’ll want to invest a fair bit of time in this at the start of each round. As with a game of poker, a certain degree of in-hand management of cards is helpful to group goods into sets. The cards are approximately the size of those in a standard poker deck, so they’re relatively comfortable to hold and reasonably easy to shuffle. If physical impairments are not linked to the hands, the game is likely to be fully playable without compensation. Take several goods, exchanging them for a combination of camels and goods from their hand. Take one single good, adding it to their hand. All of these can be orally articulated without too much difficulty. ‘Sell my first, third and sixth card for a set of three gold’. ‘Swap my first, second and fifth card for the two silver and leather in the marketplace’, and so on. While it’ll be easier to articulate and assess play if in-hand management can be done there are only seven cards at most. It’s not going to be like Ticket to Ride where you might end up with a good sixth of the deck in your hand if you’re unlucky or overly cautious with draws. The only other thing to note here is that the tokens are quite thin and it’s easy to grab too many, or too few, to correctly honour a sale. A degree of verification here may be required to avoid inadvertent over-charging or short-changing. We’ll strongly recommend Jaipur in this category – it’s playable, with support, for all levels of physical impairment without any real impact on play. There is no reading level required for round to round play, and strictly speaking no requirement for communication at all. For as frantic and energetic as the trading is, it’s all expressed as game actions rather than negotiation. My suspicion is that it would only become better as a game if everyone was loudly speaking a different language, with no-one able to hear anyone else. It would really double down on the theme. We strongly recommend Jaipur in this category. The only people in the game are the cheerful trader on the front of the box, and someone loading up a package onto a camel in the background. I would have liked to have seen a woman somewhere on the box, but at least the game shows that it draws inspiration from a richer ethnic palette than ‘white guys trading stuff to other white guys in a generic town full of white guys’. I know that Jaipur could easily fall foul of allegations of Orientalism but I think you’d need to want to pick a fight to be overly agitated by it. I understand the counter arguments here, but there is nothing about the art that is overly reductive or fetishistically exoticised. Even the turban is entirely appropriate for a region with a large number of practicing Sikhs. At an RRP of £18, it’s a little pricey for a two player game. That has to be weighed up against the fact that in my view you’ll play this again, and again, and again. It’ll fit so neatly into even the smallest cracks of your day that even if you don’t have time to play in an evening you’ll still be able to pick this up and knockout a quick round or two. It’s quick enough to play that you can even play it ‘pool hall’ style with the winner playing a challenger. It has no scope for scaling up beyond two players in individual rounds, but you could certainly house-rule a meta-game if you need to adapt it to larger groups or family nights. As such, we strongly recommend Jaipur in this category, with a small blemish because it shows two men on the front when it could so easily have shown a man and a woman. Where there is an intersections of physical and visual impairment, close examination of tokens may not be possible to do even with an assistive aide. It’s easy to knock them out of order or into the wrong columns/piles and a degree of tidying up might be necessary after each investigation. This isn’t likely to be a problem every time, but much of the assumption in our visual impairment section is that you can get up and close to the tokens to view them if the numbers are otherwise too small. The cards are sufficiently distinctive that even when dealing with an intersection of physical and visual impairment the contents of a hand should be reasonably easy to parse. Short of total blindness, or visual impairment combined with colour blindness, even if you can’t section them up ‘in hand’ you shouldn’t have too much of a problem when working with a standard card holder or two. There are no symbols or abstractions in the art, or even individuations between cards of the same type, to complicate this. The sole exception here is that one of the camels has a small panda strapped to its back, but this has no game impact. 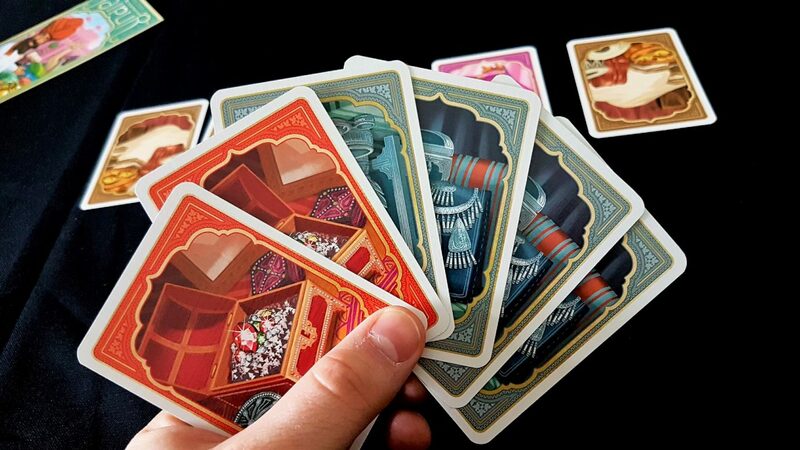 The hands in Jaipur are hidden, but none of the cards have any special effect – they are only abstract representations of goods, they don’t have powers themselves. As such, even with a triple intersection of visual, physical and cognitive impairment there is nothing in the game design that would exacerbate any of the individual issues as a consequence of hidden hands. Nobody will need anyone else to explain ‘what does this card do?’. Jaipur doesn’t support players dropping out of play, but since individual rounds last only ten or so minutes this doesn’t have to be a deal-breaker. You’ll play several rounds in a single game, and really you can end at any point you like. There’s no reason rounds have to follow each other immediately – you can stretch a full game out over as long a period as you like, focusing only on the aggregation of individual rounds. As such, not only is this game not going to exacerbate issues of discomfort it’s going to be ideal for slotting around moments of unreliable comfort, for when someone has a chronic condition with occasional let up. Jaipur is an intensely competitive game, but it’s also one with few opportunities for any given player to actively undermine the other. As such, even though you’ll be going to head to head throughout the entire play-time it’s doesn’t incentivise, or even particularly permit, players to take advantage of the inaccessibilities another may be facing. The competition in Jaipur is collegiate. This is always my favourite thing to see – a game I love that almost anyone can play. This is what I wish was true of every game we cover here on Meeple Like Us. 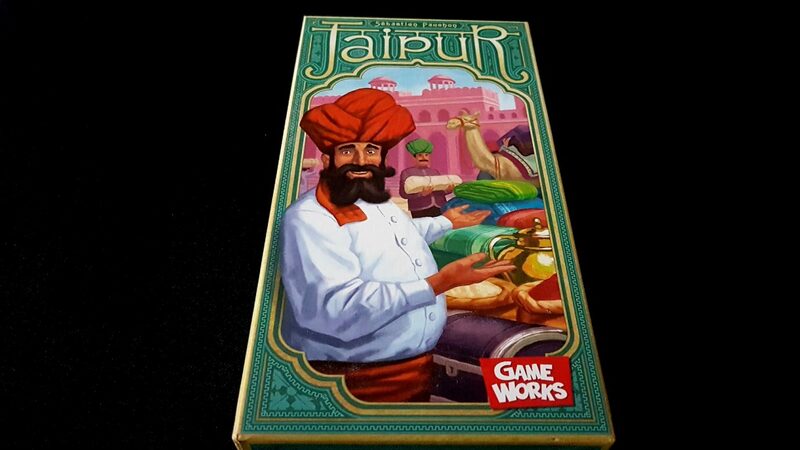 Our concerns regarding Jaipur are only minor – overall, it comes out of this teardown remarkably well with a score that puts it within a whisker of games like Lanterns and Skull. To think that I put off playing it for so long too. This is largely why I write these teardowns – for those occasions where I find gems like for which I can evangelise. Jaipur is a super game. It packs more fun than is feasible into its small box, and it does so in such a way that I’d feel confident in offering a recommendation to anyone that wants to play. It’s true some of these recommendations require a few compensations and house-rules, but none of them substantially alter the fun and joy that comes from the experience. Jaipur then comes with a serious seal of approval in all the senses that we address on this blog.